There are two times in your life that you'll always remember; the day that you graduate high school...which is more of a relief than anything else...and the night of your prom! High school is known to deliver some of the best times of your life, but it's not all about the big dance. What really seems to count is what happens after the dance, and if you're looking for the best After Prom party, Carnival Times can help make it a night to remember. That's largely thanks to industrious parent-teacher organizations that have upped the level of bribes meant to lure prom-goers back to the school grounds and — with a strict no re-entry policy — off the roads and away from drugs and booze. For the students, after-proms provide a chance to take off the formal costumes and be themselves, while keeping the idea of a special night going. 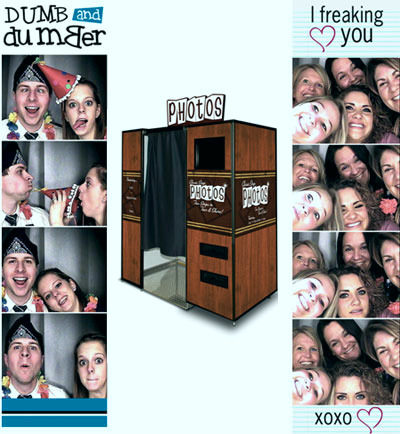 Many schools have opted for a simple casino night with a photo booth. Also a Western themed Urban Cowboy Hoedown has grown in popularity. Our favorite yet, is a "Warrior Dash" inspired event with huge obstacle courses and mechanical attractions like our Log Slammer. No event is too large or too small for Carnival Times to host. We are already booking dates now for April and May, so don't wait too long to find the right entertainment . If your date is set, then give us a call at 816.569.2855 to help you make this the very best night to remember. Jump into Spring or should we say... Slide! Spring is here, but Summer is just around the corner, and is going to bring the heat along with it. The ever so popular water inflatable slides, slip n slides, and dunk tanks are a great way to keep your guests cool! BYOT (Bring your own towels!) Reservations for these go fast so be sure to make yours before the end of May to ensure you get the unit that best fits your party theme. At Carnival Times we have some very exciting party rentals. For private parties there's a new moonwalk in town: try our Chaos Challenge or the Dual Lane Slide Combo. Many party ideas come to mind. Are you a Mizzou fan? Corporate colors are Black and Yellow? Construction industry? Caution! Both can be enjoyed by teens and adults too. No worries, we have The Wrecking Ball! Up to 4 can play at once on this high energy game. If you need a little help with the planning we have plenty of ideas, such as cone races, hammer the nail, or excavation digs to name a few. For those of you are looking to elevate the party, take a look at our new Leaps and Bounds (see the Big Baller video above for more details.) Wipeout has become a hugely popular party theme too! Everything about this fun, colorful interactive inflatable is going to make your event the one everybody will be talking about. No water required! But you can add a dunk tank for a bigger splash. Snokone Machine for Your Next Party or Event! Kids love it! And don't forget our fun food machines like Snokones, Cotton Candy, and Popcorn! Go to our website carnivaltimes.com or visit our Facebook page, Carnival Times, Inc. to see the latest event pics and more!